Cloud Nothings' best songs are like a humid early summer's day before a rainstorm, building up pressure until they can no longer take it, exploding in cathartic bursts. 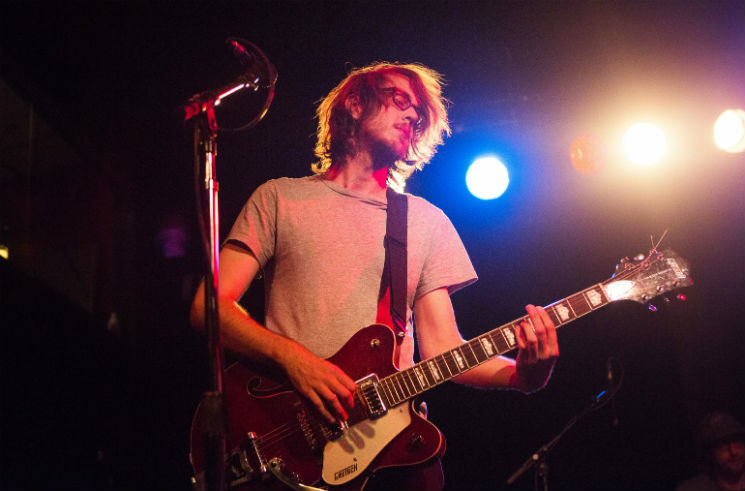 Having graduated to medium-sized venues following the release of their 2014 album Here And Nowhere Else, which features some of frontman and guitarist Dylan Baldi's strongest songwriting to date, the Cleveland trio have become a well-oiled touring machine. Inciting a pogoing pit before their first chorus, Baldi, bassist TJ Duke, and drummer Jayson Gerycz rarely broke from their triangle formation, keeping their gaze focussed on their respective instruments. They started strong with the hook-filled, caustic punk of "Psychic Trauma" and "Now Hear In," as the mop-haired Baldi's voice alternated between ragged drawl and gasping shouts. Having a good drummer can separate a band from the pack, and Gerycz is one of the best drummers in modern rock music, providing massive fills that never flagged in intensity. Even when they false-started on "Fall In," a standout from their Steve Albini-produced 2012 album Attack On Memory, they were cheered on, couples locking arms in dance while others cartwheeled off the stage. As the venue emptied out, a warm summer rain began to fall, cooling sweaty bodies and soaking still-ringing ears.